In 2012-13 there were about 32,000 hip replacement procedures within Australia alone. Obviously this means it is quite a common procedure affecting a substantial number of people, people who could be walking or limping into a typical pilates studio about to have a hip replacement or having recently had one. This article is about sharing some ideas and insights into what a hip replacement is and how to deal with clients affected by them. What are hip replacements and why do people have them? 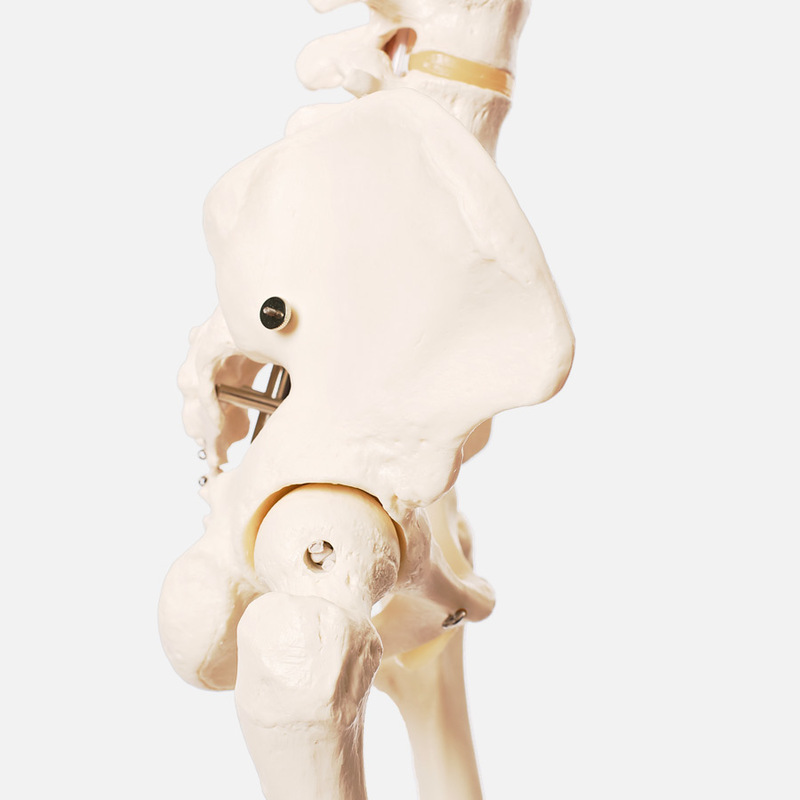 A hip replacement is generally used to describe the relining of the bone and surfaces of the hip joint with artificial parts called prostheses. The reason why this occurs is generally due to the loss of the articular cartilage of the joints because of wear and tear and arthritis. Sometimes the wear and tear can be attributable to sports and activities like golf, or because of poor gait patterning following knee or ankle injuries. There are also a substantial number of people in their 20s and 30s that have undergone hip replacements because of congenital defects. // Has a date been set, if so when? // The client’s current pain levels and tolerance for exercise. Remember they would not be having a hip replacement if they were not already in significant pain. // Exercise precautions – you do not want to see the person falling in the studio, but you do need to help them become mobile and with full weight bearing as quickly as possible. // How much muscle load you apply, as initially your focus needs to be on Range of Motion, not Strength. Strength will take at least 12 months to achieve. If you were going to have someone focussing on a strength exercise, focus on one muscle group at a time, e.g. quads, hamstrings, then abductors then adductors. Once there is correct recruitment happening in these muscle groups you start to combine the muscle groups into the more complex pilates patterns. It is pretty standard pilates programming, but never forget the basics when it comes to this sort of stuff. // Abduction presses into a theraband. Keep the classes to about 30 minutes with a focus on maybe three to four 30-minute classes, rather than pushing them to a full hour class. Remember they need to recover from strong trauma to their bone and muscle, so will be fatigue sooner than normal. Generally, there will be no ligamental stability other than through the negative pressure that occurs from the ball and socket fitting together. Joint stability is going to be a big issue for this group of people, as they will have no ligamental support after the surgery. This group will probably be sent to you before the surgery in order to strengthen them and assist in their postoperative rehabilitation. // Achieve single leg stability (the non operative leg) so that they can support themselves on that leg for at least three minutes without a wobble. // Improve upper body strength and wrists so that they can support themselves on crutches post surgery. // Bean bag series to help them strengthen their wrists and forearms. Assisted squats pre-surgery are great, but this could be too deep for people in the hip surgery category, work within their tolerance. In undertaking a mini squat remember that a person may have limitations in their ankle ROM, so help them by putting in small blocks or half foam rollers as it will assist talus glide and improved lower limb squat. // Whether they had an anterior or posterior cut of the muscles by the surgeon. It is important to remember that when the surgery is performed, the surgeon needs to dislocate the femur from the acetabulum in order to get inside the socket. This is done when the patient is anesthetised and the surgeon then lifts the femur from the knee, twists it into the acetabulum and pulls the femur out of the socket. Sounds a bit gruesome doesn’t it, and yes it is! The biggest issue used to be that for many years the surgeon’s approach was to anteriorly dislocate the femoral head. These days the more common and safer approach is for the surgeon to posteriorly dislocate the femoral head. If someone has been unfortunate enough to have an anterior dislocation they could have quite a few more complications and greater risk of postoperative dislocations. Remember, all of the dislocation occurs before the surgeon cuts into you. In recent years the standard surgical approach has changed from a surgeon cutting posteriorly through the gluteus muscles to perform the surgery to an anterior cut of the thigh. The anterior approach is considered to have less complications but it is not yet universally applied. Remember that such a surgical procedural change means new training, even new hospital equipment and so can take some time to filter down to various hospitals. // Internal rotation of the femoral head. // Focus on hip extension exercises, remembering to be careful to keep the leg lever short so as not to load or challenge the already compromised hip socket. 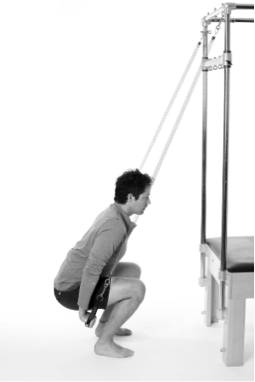 A great exercise for hip extension. 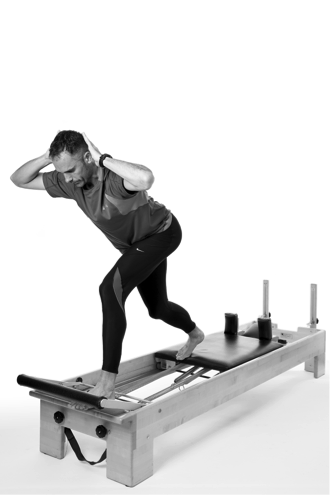 Remember you need to ensure that the standing platform is in the reformer, so when someone first starts you are going to be standing next to them and they will need a pole or some other support to help. Remember that once the three months has passed the gradual introduction for flexion and abduction of the hip should occur. The introduction of internal rotation can take much longer to achieve. You need to be listening to your clients and checking what their tolerance for movement really is. The resurfacing implants are designed to take out the least amount of bone as possible. A metal cap is used to cover the femoral head and this articulates with a highly polished metal cup. The considerations for this type of surgery are similar to a total hip replacement. // They will have trouble getting up and down off the floor, so don’t do that to them. Make sure you have them do any matwork on the caddie or even start developing work they can do by sitting on a little stool. It is amazing how much of the matwork can be adjusted to an Ikea stool! // They are going to have been on some serious pain killers, with all sorts of consequences for balance, memory and concentration. Make sure you know what they are on so you know how to work with the side effects. Also make sure that you know their taper plan, because you are going to need to make adjustments to their effort and tolerance during this period. Carla Mullins is co-director and co-owner of Body Organics, a multidisciplinary health and body movement practice with 3 studios in Brisbane. Carla is a Level 4 Professional Practitioner with the APMA and has also studied pilates with PITC as well as Polestar. She also has a LLB (QUT), M. Soc Sc & Policy (UNSW), Diploma Pilates Professional Practice (PITC), Gyrotonic Level 1, CoreAlign Level 1, 2 and 3 and Certificate IV in Training and Assessment. Can I claim a rebate for my Pilates classes after 1st April 2019?